Introducing the new 2-Way Personal Trainer Talk Back System. This system can be used for one-way or two-way conversation between trainer and rider for up to 15 hours. 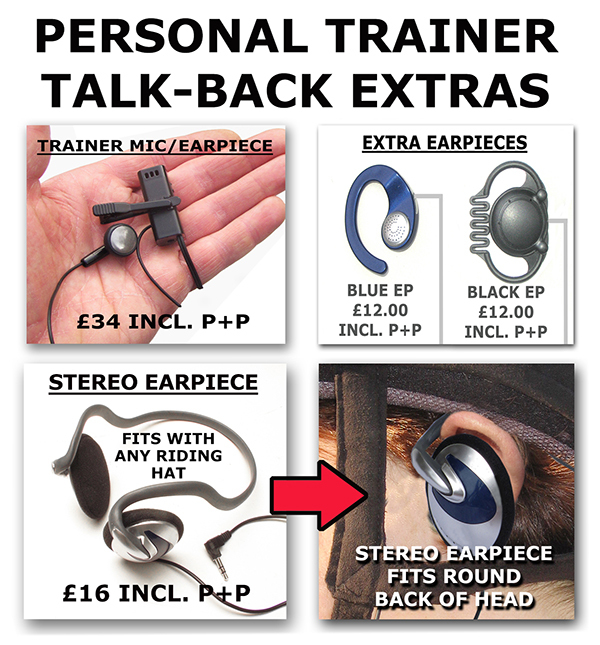 The new Personal Trainer 2-Way Talk Back System costs £299.00 including free insured courier delivery by 1pm (Mon-Fri, UK only). Please note prices shown are for payment by debit card, credit cards will incur an extra charge. One-way conversation: Trainer unit and separate microphone are clipped onto lapel (see "Trainer's Unit" picture above). Rider clips their unit onto lapel and wears an earpiece (see "Rider's Unit" picture above). Two-way conversation: "Trainer" picture above - Trainer wears earpiece that is attached to trainer’s microphone. "Rider" picture above - Rider unit has built-in microphone. Rider talks back by pressing mic button on unit, which can also be permanently depressed for full 2-way conversation. Conversation can be muted as required. System is extremely small and light weight (units weigh 50 grams each). By using the supplied audio lead plugged into trainer's mic, music can be played in the background from a phone, while rider and trainer talk over the top - ideal for music dressage tests. Kit includes USB battery charger (can be used anywhere in the world with travel adapter), charger leads, audio lead and kit bag. Optimal tested range is 100m. Built-in batteries recharge in 12 hours, providing around 15 hours of continuous use on a single charge. Up to four additional units can be added (only one person can talk back at a time). Additional receivers cost £140 each. 3 year warranty on components (battery warranty is one year).